Rachel’s line of gourmet yogurts is probiotic, enhanced with Omega 3s, kosher...and fashionable. Why didn’t they put the words “probiotic” on the front of the container? They’d sell more to probiotic-hungry Americans! 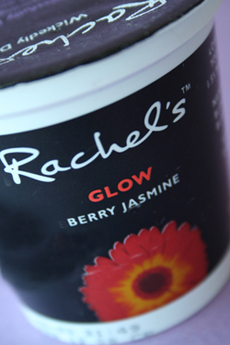 Read our full review of Rachel’s yogurt. Part III: Which Foods Contain Probiotics? This is Part III of a seven-part article. Use the article index below to click among the sections. PART I: What Are Probiotics? PART III: Is It Really A Probiotic? Is It Really A Probiotic? Lactobacillus bulgaricus and Streptococcus thermophilus are the classic yogurt starter cultures. However, neither survives the initial digestion phases particularly well or reaches the gastrointestinal tract in great numbers. For this reason, some do not consider them probiotics. Most people, however, point to the intermittent evidence that these two bacteria can improve lactose digestion in some individuals and may help promote a healthy immune system, so they are usually classified as probiotics. For a culture to be considered genuinely probiotic, it must be safe to eat, remain alive for the shelf life of the product and be present in a high enough quantity to have a beneficial effect. The U.S. is way behind Europe, where probiotic beverages go beyond Kefir to include soy-based drinks like ActiSun, and Omega-3 heart-healthy beverages like Flora, that are enriched with probiotics. In the U.K., Nestl� sells a probiotic kids’ drink, Munch Bunch Drinky+, that contains probiotics and Omega-3s. Earlier this year, Indian manufacturer Amul even launched a probiotic ice cream. For now, though, Americans will have to start with the basics. Of all the probiotic-containing foods normally sold in the U.S., without doubt the most familiar is yogurt. Yogurt is usually made from milk (rarely, from cream) inoculated with Streptococcus thermophilus and either Lactobacillus acidophilus or Lactobacillus bulgaricus. The milk may be from cows, goats, sheep or even water buffalo (read our review of Woodstock Water Buffalo Yogurt). Yogurt is an ancient food that may be Turkish in origin, although its true history has been obscured by time. In the U.S., yogurt is available in innumerable forms and flavors, from lowfat chocolate yogurt, to drinkable fruit-flavored goat yogurt, to neon-colored yogurt in squeeze tubes geared toward kids. Although the U.S. is catching up, people in Europe and the Middle East still consume far more yogurt than we do. Especially in the Middle East, yogurt is often used as an accompaniment to, or an ingredient in, savory dishes. For most people, yogurt is their principal probiotic food. While all U.S. yogurts must include live cultures of Lactobacillus bulgaricus and Streptococcus thermo-philus, Stonyfield’s yogurt line is probiotic because it includes four more live cultures: L. acidophilus, L. casei, L. reuteri and bifidus. 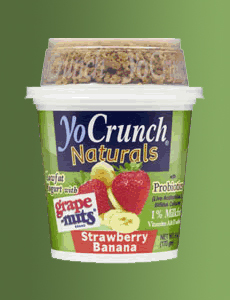 You may have to read the back label—not all yogurts blast “probiotic” on the front like YoCrunch does (see photo below). Notice the word “Probiotic” on the right side of the yogurt container? You’ll be seeing it a lot more on all kinds of foods. Read our review of YoCrunch Naturals probiotic yogurt. All yogurt is not equally beneficial. Additional cultures to those listed above may be added. Some producers also pasteurize the yogurt after the cultures are added, which will kill off the bacteria. If you’re eating yogurt for the benefits friendly bacteria may confer upon your system, that’s not what you’re after. Be sure to check the label to see that your yogurt contains live and active cultures; if you don’t see the information you need there, contact the manufacturer. Some manufacturers don’t list the specific cultures used; their ingredient roster will merely indicate the use of “cultured milk” or something similar. If it’s important to you, follow up. Check the website or contact the manufacturer directly. What kinds of probiotics numbers are we talking about in yogurt? 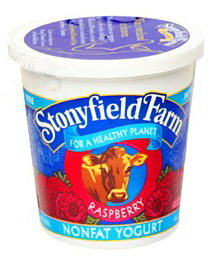 Stonyfield Farm, whose yogurt contains six different probiotics, says their yogurt has a minimum of 100 million cultures per gram. Yogurts from Springfield Creamery (sold under the name “Nancy’s Cultured Dairy and Soy”) contain four different probiotics, and a sample of their yogurt that was eleven days old was measured as having 1.35 billion cultures per milliliter (that’s the equivalent of one gram). 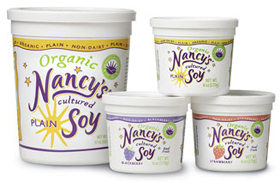 Nancy Van Brasch Hamren, the “Nancy” in Nancy’s Cultured Dairy and Soy, cautions that any probiotic count is merely a “snapshot in time.” As dairy products age, the culture count lessens, sometimes significantly. Springfield Creamery points out, however, that even toward the end of its yogurt’s shelf-life, it contains a minimum of 300 million cultures per gram. Some other manufacturers told me straight out that they didn’t know this information, which isn’t altogether bad. It’s easy to fall into the trap of a numbers game when dealing with probiotics, and at present there is simply no agreement on the quantities of probiotics people might require, or even whether they require any. Before long, we predict that frozen yogurts will be getting on the probiotic bandwagon. For now, we’ve spotted LaLoo’s Goat’s Milk Frozen Yogurt, which is naturally chock-full of S. Thermophilus, L. Bulgaricus, L. Acidophilus and Bifidus. 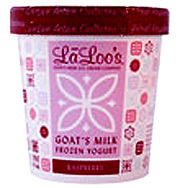 These weren’t added to pander to the trend, but rather, because LaLoo’s is a healthier brand of ice cream overall (goat’s milk is lower fat and can be tolerated by many lactose-intolerant people). Read our full review of Laloo’s Goat’s Milk Ice Cream. K-what? It’s pronounced key-fur, keh-fur or keh-fear, and it’s a fermented, probiotic-containing beverage. Kefir can be made from cow’s, goat’s or sheep’s milk, as well as from plant “milks” such as soy, rice or even coconut. The chosen milk is inoculated with kefir “grains.” Despite their name, these are not cereal grains. Instead, they are a mixture of bacteria, including Lactobacillus kefiri and species of the genera Leuconostoc, Lactococcus and others, along with lactose—fermenting and non-lactose-fermenting varieties of yeast. Kefir grains consist of many individual bodies of a soft, gelatinous white or yellow mass that is somewhat elastic and often compared to cauliflower in appearance. Added to milk and stored at the proper temperature, the kefir grains eventually “culture” the milk, and leave it thickened and very slightly effervescent (a result of the creation of carbon dioxide during the culturing process, as well as a tiny quantity of alcohol). The grains are then strained out. Kefir, like yogurt, is available in a range of flavors; and consumers can choose from organic or conventionally produced kefir, as well as whole milk or low fat varieties. Unlike yogurt that comes in a carton, however, kefir is a beverage, albeit a thick one. Kefir is often compared in taste and texture to drinkable yogurt. The history of kefir is an uncertain one. Some stories place its origin in Turkey, while others declare kefir first saw the light of day in what is now Russia. In any case, kefir seems to have gotten its start somewhere in or near the northern part of the Caucasus mountain range. There are records of charming tales about the snack, including a belief among some Muslims that the original kefir grains were given to them by the Prophet Mohammed, and that their kefir would lose its vitality if used by heathen who practiced other religions. Kefir still suffers from lack of good product recognition in the U.S., but it is now more widely available in supermarkets and natural food stores than it was even five years ago. The commercially-made kefir in the U.S., of which I am aware, has more different strains of probiotics than does commercially-produced yogurt. How about numbers in probiotics? Lifeway Kefir declares that a one cup serving of their kefir contains around ten billion probiotics. As happened with yogurt, another manufacturer told me they didn’t have any kind of a probiotics count for their product. Lifeway kefirs come in a variety of flavors and types, including whole milk, lowfat and nonfat. Cultured dairy products are consumed in large areas of the world. Aside from yogurt and kefir, this includes cultured buttermilk (originally a fermented byproduct of butter-making, but now most commonly used as an ingredient in baking), acidophilus milk (milk inoculated with Lactobacillus acidophilus, then fermented) and sweet acidophilus milk, in which the culture is introduced but no fermentation follows, reducing the higher acidity and fermented flavor of regular acidophilus milk but still allowing the bacteria to stay alive. The lebne (spreadable cheese made from yogurt) so popular in the Middle East contains cultures, as do the Finnish specialties viili (cultured whole milk) and kermaviili (cultured cream). Other cultured dairy products, such as lassi, dahi (also called dadhi), maziwa lala and chach are enjoyed in other nations. Horizon Organic produces sour cream and cottage cheese with added “health-promoting live and active cultures for digestive health.” According to Horizon, these cultures, Lactobacillus acidophilus and Bifidobacterium, are in a concentration of at least one million CFU per gram at the end of shelf life in both products. Most cheeses, by their nature, also contain cultures, but remember that, just as all active cultures are not probiotics, not all cultured dairy products will contain significant concentrations of probiotics. The first probiotic juice was launched in the fall of 2007 by Next Foods, founded by Steve Demos (who also founded Silk soy milk). 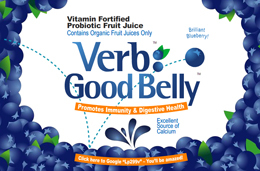 GoodBelly is an organic fruit juice-based probiotic beverage that contains a patented probiotic called Lactobacillus plantarum 299v, which was developed in the U.K. and has tested well for its effects on Irritable Bowel Syndrome. Twenty billion live probiotics are in each serving juices to provide digestive health. Three initial flavors include Brilliant Blueberry, Peach Mango and Strawberry Rosehip. They taste a bit more serious than regular sweet fruit juice. Learn more at VerbDaily.com. Whether it’s sauerkraut in Germany, kimchi in Asia (especially Korea), cortido (or curtido) in Central America or choucroute in France, fermented cabbage is consumed wherever cabbage itself can be grown. A head of cabbage can be sliced before fermentation, but it may also be left whole. Unlike probiotic-containing foods that start from a dairy base, cabbage does not need bacteria added to it to begin the fermentation process. All you need to add, in fact, is salt (the addition of vinegar is looked upon with contempt by makers of “true” sauerkraut, who declare that it’s used only by those who don’t take the time to go through a full fermentation process and want a cheap and quick way to achieve acidity). Cabbage will ferment with the correct level of salinity (about 1.5%) and at the proper temperature (temperature is important to every fermentation process—just ask your local brewer). Several different bacteria are at work during this process, and those bacteria change as the acidity of the brine surrounding the cabbage increases. 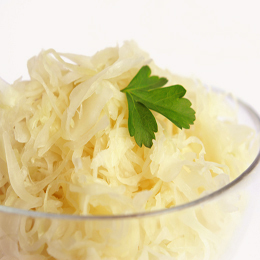 The most commonly cited probiotic associated with sauerkraut is Lactobacillus plantarum. Many commercially available fermented cabbage products have been pasteurized; such treatment with heat will destroy any friendly bacteria. Photo of sauerkraut � Marlena Zagajewska | Dreamstime. Great Lakes Kraut manufactures about 75% of the sauerkraut made in North America. 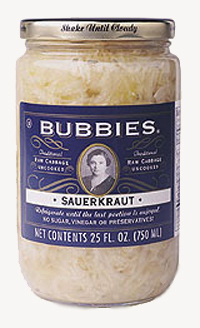 Ben Frega, Vice President of Sales and Marketing, notes that the sauerkraut his c ompany currently produces (under a number of different names, including Silver Floss), is pasteurized to stop fermentation if the product is to be sold as shelf-stable. This includes cans, jars, and pails of sauerkraut. If fermentation was not halted, the sauerkraut containers would swell or explode, since any active fermentation process will produce gases. The preservative sodium benzoate, often added to sauerkraut and other fermented vegetables, will also kill friendly bacteria. However, Great Lakes expects to introduce an organic, unpasteurized, refrigerated sauerkraut to the market by or during summer 2007, to be sold under the name Cortland Valley Organic Sauerkraut. Other organic sauerkrauts include one from Rejuvenative Foods in California, Bubbies Old Fashioned Sauerkraut and Wills Valley Sauerkraut. Again, any of these brands (or any others) must be in refrigerated form if you’re looking for live cultures, and check the label to make sure no sodium benzoate has been added. Photo of olives courtesy of Stock.Xchng. Salted gherkins and brine-cured olives (as opposed to freshwater-cured, lye-cured, oil-cured or dry-cured) made via traditional methods also carry high concentrations of various strains of lactobacilli. Again, however, many such commercially available products are pasteurized to ensure shelf stability and/or contain sodium benzoate for longer shelf life. Below are several brand-name, probiotic foods available in the U.S. Expect to see more of these types of products in the future! 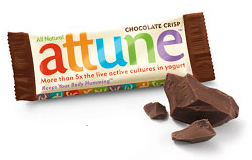 Attune makes Wellness Bars in three chocolate varieties and three yogurt and granola varieties. All products contain “more than 5 times the live active cultures in yogurt, with less sugar.” I have issues with some assertions on this product’s website, including a statement that these bars contain probiotics in amounts “proven to help promote strong, healthy digestive and immune systems.” For starters, one of the research studies quoted is on perceived health benefits resulting from ingesting Lactobacillus acidophilus and Lactobacillus casei. I recognize that there is a psychological component to most aspects of health, but whatever happened to objective testing? Our editor is not happy about the “More than 5x the live active cultures in yogurt,” because it refers to regular yogurt, not probiotic yogurt—a meaningless apples to oranges comparison that confuses the consumer, she complains. Still, not everything on this site lacks credibility; see Probiotic Hype-And Getting Past It. And read our editor’s review of Attune Wellness Bars. 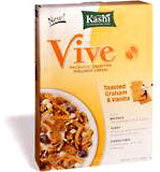 One of the first cereals with probiotics added to it, Vive contains one billion CFUs of Lactobacillus acidophilus per serving. Yakult is a probiotic, cultured dairy beverage, similar to kefir and other yogurt-based beverages but made with a different bacteria culture. It has a citrus flavor (it contains flavorings and sugar), and is sold in single-shot containers that contain around 8 billion live and active Lactobacillus casei Shirota cells per bottle (the strain is exclusive to Yakult products). Yakult Honsha Co., Ltd. was established in Japan in 1955 and is one of the pioneers of probiotic foods. Yakult is available in a number of countries worldwide, including Argentina, Japan, the U.K., Uruguay, several European nations and, in limited areas, the U.S.
An organic, non-dairy, rice “yogurt” with whole grains and live, active cultures, including Lactobacillus bulgaricus, Streptococcus thermophilus, Lactobacillus acidophilus and Bifidobacterium bifidum.